AVX – Who’s the best? I tried having everyone vote for their favorite, but after having to recount Florida three times I gave up. With the latest organized play event AVX players have been given a choice of picking the Avengers or X-men starter to base their army around. Which one should you chose? Here’s a detailed breakdown of which one’s better. Winner – Vampire Jubilee. Just kidding. Avengers take this category too. AVX004 Spider-Man – Essentially this character has hypersonic speed with a 10 attack and 5 damage (including super strength). That’s really good for 125 points! The real story here is his defense which is the best of any figure in any set in his point range. AVX003 Thor – Thor has a chance at penetrating ranged damage and a 12 starting attack. I will play that at every opportunity. AVX014 Magneto – For 200 points this guy is a worthy tent pole. If someone is going to take on Thor’s ranged attack value of 12, it should be this guy with his 20 ranged defense. If your opponent wants to close in Magneto can use Pulse Wave for full damage that bypasses defense. He just needs a 100 point close combat character to throw into the melee with his TK while he stays at range with his huge defense. AVX010E Emma Frost – This is a 100 point close combat character just begging to be thrown into the melee with TK. When it comes to her, everything is awesome. Outwit/Charge/and Exploit Weakness on offense. Impervious and Shape Change on defense. Even better she can’t have any of her powers countered. If you are good at rolling 5s and 6s she is going to stick around quite a while. AVX009E Cyclops – For 100 points this guy’s shoot through walls trick is really good. It’s even funnier when you outwit someone through 3 walls. He has close to no defense, but with the offense he brings for his point cost he might not need it. Winner – Xmen. 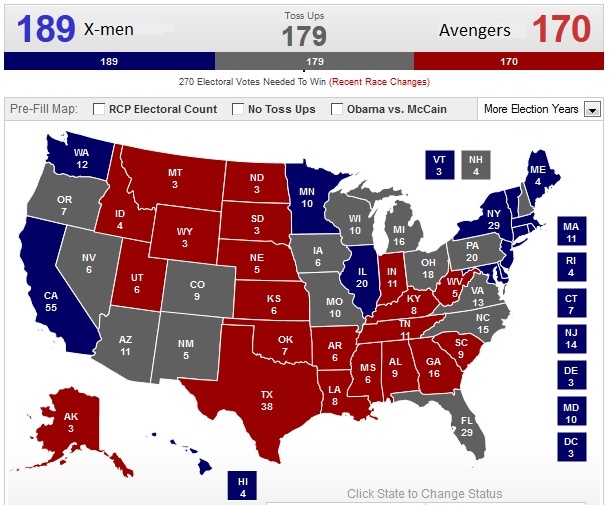 This was really close, but I think the top 3 X-men edge out the top 3 Avengers in AVX organized play. I think all the figures in the set are great for their point cost. The worst of the bunch are Iron Man and Namor. Besides those two, anyone else would be a great addition to a team. Worst Movie moment for Avengers: Loki can’t mind control Tony Stark because his staff can’t hit the exact center of Tony’s chest. Coolest Movie moment: For shear wow factor, watching Wolverine pop his claws on screen for the first time ever was the best. The Avengers movie was better then X-men, but X-men had the best moment.